CHESTER — Leif Nilsson Spring Street Studio and Gallery presents the next Concert in the Garden on Saturday, April. 13, from 7 to 9 p.m.
D.B. 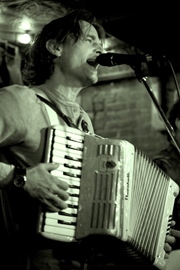 Rielly is an award-winning singer/songwriter and multi-instrumentalist who, along with his band, performs a wide-ranging collection of Americana music, including Roots, Zydeco, Blues, and Alt-Country. A $20 donation at the door is requested. Feel free to BYOB and picnic and enjoy the outdoor bistro style seating in the amphitheater (inside the gallery if inclement weather).Gates open a half hour before the show. First come, first seated, but no pets allowed. For more information, call (860) 526-2077 or visit http://www.nilssonstudio.com. The studio is at 1 Spring St., in the heart of Chester Center.